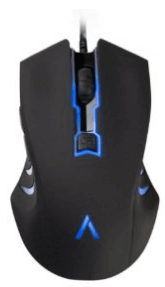 The Azio GM2400 gaming mouse is an affordable mouse with performative ability above average for its entry-level price range. But a major design flaw makes this a tough sale for gamers with particular ergonomic preferences. Overall, despite its ergonomic limitations, the Azio GM2400 is a great mouse for gamers who use the claw grip. First off, the software installation was quick and easy. 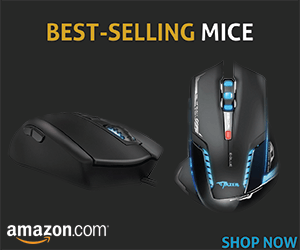 The mouse doesn’t come with a CD, so you just have to plug the mouse and use it. To do custom mapping, you must use third party software which can be found online for free. This isn’t a big deal, but I’ve used a great deal of other mice that are accompanied with more convenient instructions and software. That said, you actually don’t need any software, because all the mice made by Azio are software free. The blue lights of the mouse create that classic gamer feel and they shut off with the computer to indicate it’s been powered off. Also, the lights are designed like shark fins on the side, giving the mouse a sleek, “predator” look. If only the same could be said of its design. Oh, wait. It can. Yes, folks. After playing with this mouse for about half an hour, my hand was wickedly uncomfortable. Let’s get down to the bottom of this design flaw. When I first picked up the Azio GM2400 I noticed it was difficult to grip if you prefer to palm your mouse. This is due to the mouse’s symmetrical design which leaves your ring finger on the right side, but most gamers tend to use their middle finger to click. To accommodate the design flaw, you may have to raise your ring finger. My ring finger was slightly elevated, which made it difficult to hold for more than thirty minutes. Personally, I do not like to claw grip my mice, but if you do then the Azio GM2400 won’t give you any problems. 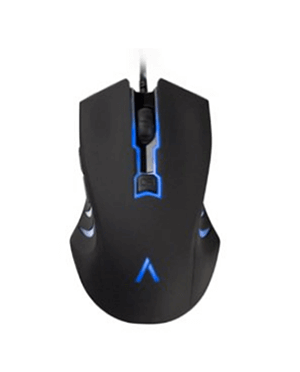 And even if you aren’t a claw-gripping-gamer then I think you’ll find the Azio’s design to be easy to adjust to. In under an hour or so, I barely noticed the change. Besides this, the mouse has a sufficient amount of buttons, which are located on the sides of the mouse and on the mouse wheel. Its braided mouse cable is 5ft. long and can be used in nearly all gaming settings. In addition, the mouse connects via a gold plated USB connector. Nothing fancy, but it works. Although I never encountered any problems with the accuracy and speed of the sensor, it is nothing special. Throughout my experience, I have found that optical sensors perform better than laser sensors in this performance range. The Azio is especially great for rough surfaces and limited space. Overall the sensor is pretty awesome and worked perfectly while I was playing CS:GO. With its 6 buttons, you have more than enough customization options. One of those options is its on-the-fly DPI adjustment, which you can set to 800, 1200, 1600, or 2400 with the click of a button on the scroll wheel. I always think this is the best feature on any mouse in terms of DPI. Even if you’re not too picky about your DPI, it leaves room for growth if you ever choose to play more than one type of game. The overall build of the mouse is pretty okay. Quite frankly, it’s plastic body doesn’t feel solid or sturdy and I stopped myself from gripping the mouse too harshly on several occasions for fear of its longevity. This can be a frustrating thing to deal with in a gaming mouse that you plan to use for intense multiplayer sessions. It was even more challenging to deal with the mouse’s awkward grip and design style—up to a certain point. The Azio’s bold sleek design may compensate for some of its flaws and limited software capabilities. If you can get over the awkward design for palm gripping then this mouse may work out for you. 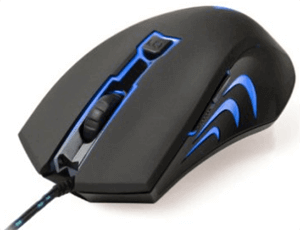 It performs exceedingly well for a gaming mouse in its class and it’s far better than any average gaming mouse int his price category.